Snoop Dogg, Vampire Weekend, Flaming Lips, Dizzee Rascal and the Pet Shop Boys are among the bands playing this year's Glastonbury festival, it is being claimed. The website glastowatch.co.uk says that "several sources have sent us the following highlights" but acknowledges that they cannot guarantee with "100% accuracy" that the names listed will definitely play. 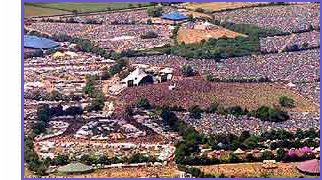 The site lists acts from three main stages – the Pyramid, Other and John Peel stages – and includes support spots from Scissor Sisters and Faithless. The headlining acts of U2, Muse and Stevie Wonder had already been confirmed by the festival. Glastonbury have yet to confirm or deny whether the artists listed will be playing at the festival. looks amazing although some major clashes (U2 / Flaming Lips urgh) ..... what does everyone else think?